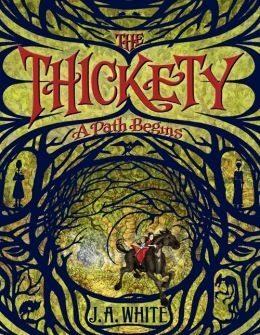 The Thickety: A Path Begins by J A White is first of all a beautiful object. As a book, it is not book-shaped, but squarer than most books tend to be. The cover illustration of silhouettes of people, creatures, and tree branches is an enticing montage, with a depth that leads the observer deeper into the imagery. Seeing it for the first time, and hefting its weight in my hand, I felt the same sort of tingle as when I first saw the title Lord of the Rings. I felt an immediate connection with the book. There are a few interior illustrations inside, mostly of silhouettes, but they really do enhance the look and magical feel of the book. They are decorative, without trying to upstage the text itself. The Prologue starts off with a powerful scene that involves a child being apparently kidnapped and taken to witness the burning of her mother as a witch. The depth of the feelings are sketched in, but lightly presented, as befits the age of the projected readership. The following chapter opens up some years later and the story is about the kidnapped child, Kara, and the fate of her family after the destruction of her mother. The world as presented suggests something of a seventeenth-century, Amish-style, village milieu. There are suggestive hints of the “World” outside the village and the community is plainly an enclosed society that rejects materialism and scientific progress, focusing on its cultic history concerning the rejection of witchcraft. Is the world-setting one of a post-apocalyptic environment? It’s not plainly stated, but the vegetation known as the Thickety is attempting to overrun the village on their island. The creatures that live in the Thickety are magical and chaotic, with chimeras abounding. Central to all this mystical-magical environmentalism is a figure, half-bogeyman, half-Green Man, presumed to be hostile, predatory and satanic, by the name of Sordyr. The narrative is all told through the eyes of the witch-child, Kara Westfall, and it is beautifully paced and perfectly pitched as it enumerates the hazards of her life as an outcast and object of suspicion. Secrets are sewn into the fabric of the story, only to be unpicked later to reveal a deeper, richer picture. The supporting characters all enrich the story, ranging from Kara’s younger sickly brother, through her fellow outcast father, to friends, neighbours, teacher, and townspeople. The magic itself is bewitching and intriguing; and the unwrapping of each mystery is delicious to behold. With the subtitle, A Path Begins, I received a frisson that this might well be a series, and the ending is set up for further adventures. I, for one, will be anxious to follow the further adventures of Kara and the rest of her cast, as she explores her world, and her own emotional growth. JA White is a master story-teller, and this book deserves to make its way in the world.